This is huge for Jim Harbaugh, whose team has won six straight and entered the top 10 for the first time this season. The Wolverines (6-1, 4-0 Big Ten) have established themselves as a real factor in the Big Ten East after being picked fourth. 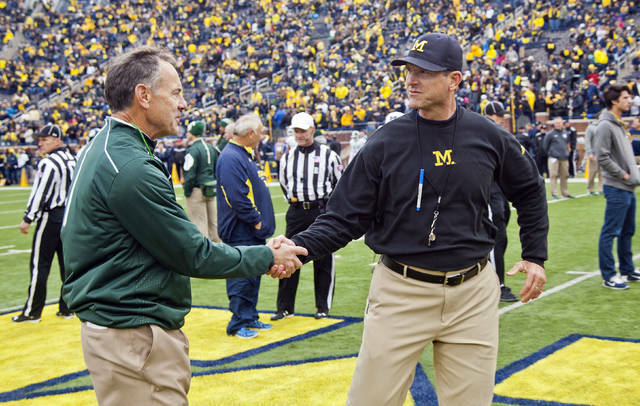 The Spartans have won two of three against Harbaugh-coached Michigan teams, and eight of 10 in the series, and would love nothing more than to derail the Wolverines’ run. The question: which MSU team will show up? The Spartans (4-2, 2-1) lost to Northwestern at home two weeks ago and beat Penn State on the road last week. Blough has completed 110 of 181 passes (68.3 percent) with 1,573 yards, 10 touchdowns and two interceptions over his last four games. 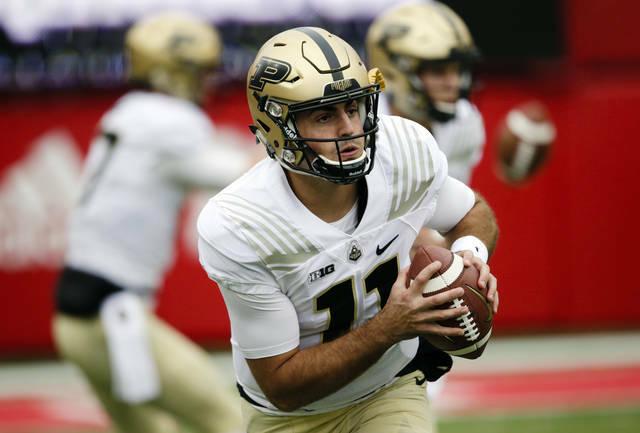 He’s also rushed for two scores and became the first Purdue quarterback to catch a TD pass since Brandon Hance in 2001. Ohio State has allowed more than 300 yards passing twice, most recently against Indiana two weeks ago, and is seventh in the conference in pass defense. Wisconsin has eight sacks through six games; the Badgers had 20 at the same point in 2017. … Northwestern LB Blake Gallagher has had double-digit tackles in three straight games, making him the first Wildcats player to accomplish the feat since Anthony Walker Jr. in 2015. … Rutgers, last in the FBS in turnover margin, has had eight turnovers vs. one takeaway over its last two games. … Nebraska, on a program-record 10-game losing streak, would lose a seventh straight in the same season for the first time since 1957 if beaten by Minnesota . … Illinois’ 229 rushing yards per game is more than double its 2017 season average of 106. … Penn State’s Trace McSorley is completing 54.1 percent of his passes for 206.8 yards per game, compared with 67 percent for 266.2 through six games in 2017. … Freshmen have had a big impact at Indiana, accounting for 11 of 14 takeaways, including the last seven, and RB Stevie Scott is second among true freshmen nationally in yards (557) and carries (115). The Terrapins (4-2, 2-1) will be going for a second win over a ranked opponent when they visit the No. 19 Hawkeyes (5-1, 2-1). RBs Ty Johnson and Anthony McFarland combined for 206 yards last week, but that was against lowly Rutgers. This week the Terrapins face a defense that allows just 2.7 yards per carry and has allowed only four rushing touchdowns. If interim coach and offensive coordinator Matt Canada can’t find a way to get the ground game moving, it’ll be a long day. 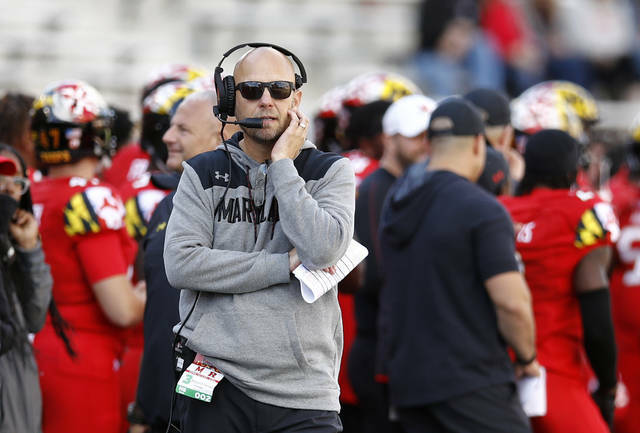 The Terps have the lowest-ranked passing offense of any non-triple option team. The Gophers rushed for more than 400 yards against Nebraska last year, and the winless Cornhuskers remain vulnerable to the run. Minnesota’s hot hand is Ibrahim, who ran for 105 of his 157 yards against Ohio State in the first half last week. Shannon Brooks has been medically cleared to return after an offseason knee injury, but his status is uncertain following his weekend arrest on suspicion of misdemeanor domestic assault. The Huskers are allowing 177 yards per game on the ground to rank 10th in the Big Ten.